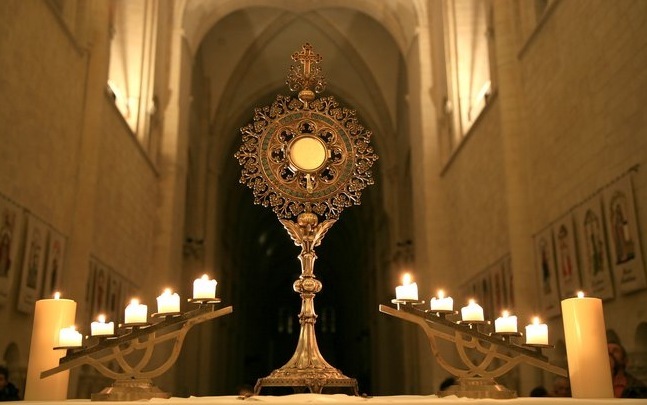 Every Friday morning from 7:30 – 8:30 a.m. we have a Holy Hour in the Church where the Eucharist is visibly displayed for silent communal adoration followed by Mass at 8:30 p.m. The idea of the “hour” derives itself from the scene in the Gospels before Jesus was arrested and the following day crucified. In the garden with Peter, James and John, Jesus undergoes great emotional and mental anguish as his death looms near and he prays to his heavenly Father, all the while his disciples sleep. Jesus asks them, “Were you not able to stay awake for one hour?” Mark 14:37 The “hour” in sacred scripture is always related to evil (when evil would seem to have triumphed in the death of Jesus on the Cross) when the Devil has his hour but God has his day, as in “The Day of the Lord.” In silence we look at Jesus which leads us to an even greater appreciation of receiving him at Mass in the reception of the Eucharist.